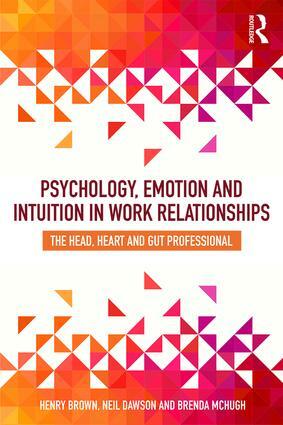 Psychology, Emotion and Intuition in Work Relationships: The Head, Heart and Gut Professional highlights the increasing importance of human relations in professional life. In modern society, all those who work with or provide services to others are increasingly called upon to be not just technical experts, but also ‘head, heart and gut professionals’ – whocan work and relate to others with their head, heart, and gut. The book explains and synthesises these elements in an accessible way, based on a sound theoretical perspective combined with practical guidance. The authors address how to manage client expectations; how to deal with risk, uncertainty and imperfection, as well as how to improve communication and interpersonal skills. Attention is also given to the central role of empathy and rapport in professional relationships, while recognising the need for proper professional boundaries. Psychology, Emotion and Intuition in Work Relationships will be a valuable guide for all modern practising and training professionals in a broad range of fields, including mental health, law, social and healthcare, teaching and academia, technology, financial and other services – indeed, for anyone who provides services and has working relationships of any kind.